This was a week filled with cheese making...failures!!! I guess it has to happen at some point! I mentioned on my Garden Blog that making Mozzarella is falsely labeled an "easy beginner cheese" to start with. WRONG! Depends on the type. My Buffalo-style fresh Mozzarella is a snap to make using the 30-minute recipes. But Cultured Mozzarella...that's a different story. Cultured just means that you add bacterial culture to it to give it a different flavour and consistency. It's made in a very different way than the 30-minute recipe. It takes a day of dedication! 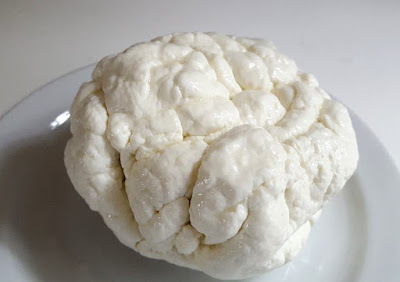 I read that making a cultured cheese would make a drier Mozzarella that I could use for pizza. Well, as you can see, attempt number one turned into a curd. Salvaged, but disappointing. Attempt number two turned into a cauliflower-brain-like glob! I tried two different recipes and followed them word for word, but neither of them stretched. 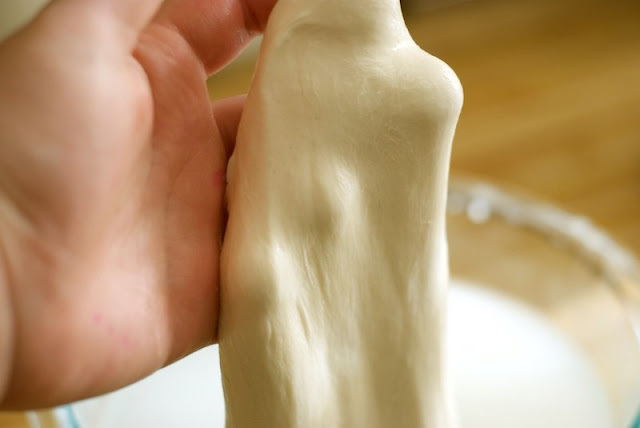 This is what Mozzarella should look like at the final stage - stretched out with no breakage. This stage gives the cheese it's nice smooth texture. Mine didn't even come close. I downloaded a few more cheese making books which I'll be reading this week for some answers hopefully. I also emailed the cheese recipe maker for advice. His response was typical of a seasoned cheese maker and I need a "Pro-cheese-maker / Rain cheese-maker" dictionary to figure out what he's talking about! Each batch was just as time-heavy as the Cheddar, about 8 hours. And this isn't a cheese you can leave alone. 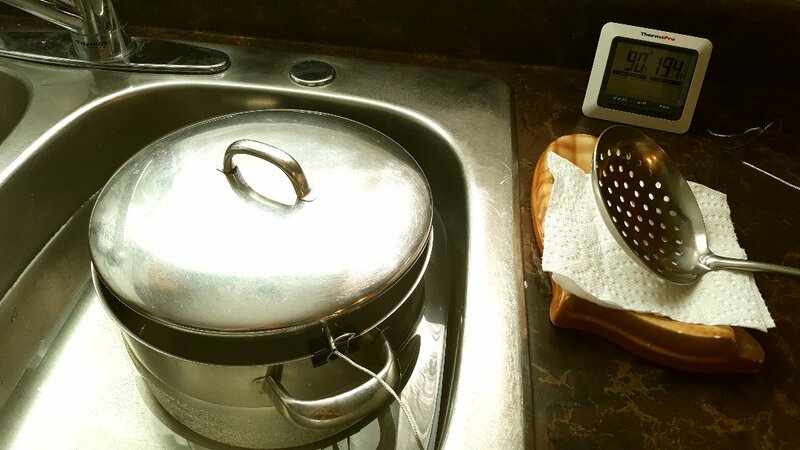 I'm really glad I got a new digital thermometer for cheese making! Of course, we can use it for meats too but it's a lifesaver. It has an alarm that goes off if your temperature gets higher than you want. This saved me a few times so I could make sure the cheese didn't overcook. This was the result of my third attempt at Cultured Mozzarella. 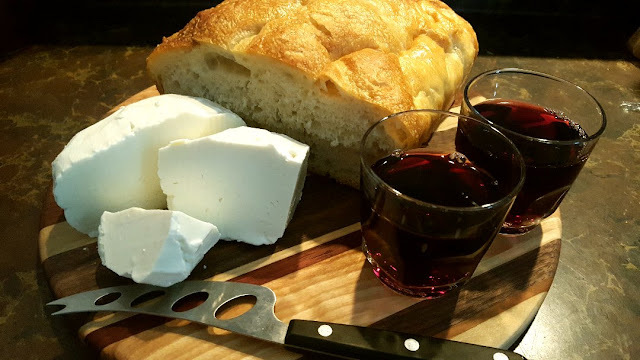 I copied the recipe from a book called Making Artisan Cheese by Tim Smith. But like I mentioned above, I followed the recipe and the cheese still didn't stretch. It turned out much better than the first two though, this one stayed together, was smoother and harder. It's in the fridge now and I want to see if I can grate it for pizza, since that was the reason why I tried making it! I feel like if I fail again at the Cultured Mozzarella that I will need a big break...I don't want to get discouraged at all so I'll try an easy Dry Jack cheese first, then see how courageous I am! It takes time to master something! Practice, practice, practice :) I personally think you're doing great. 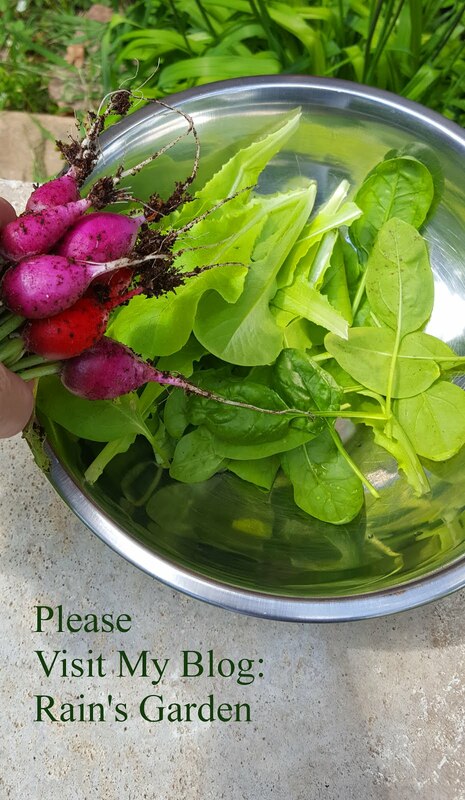 I don't know too many people who has as much patience as you do for something that requires oodles of patience! 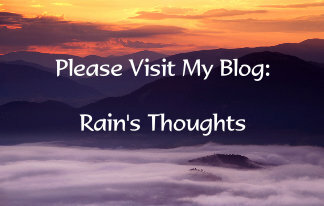 Wow ~ This is fascinating, Rain! 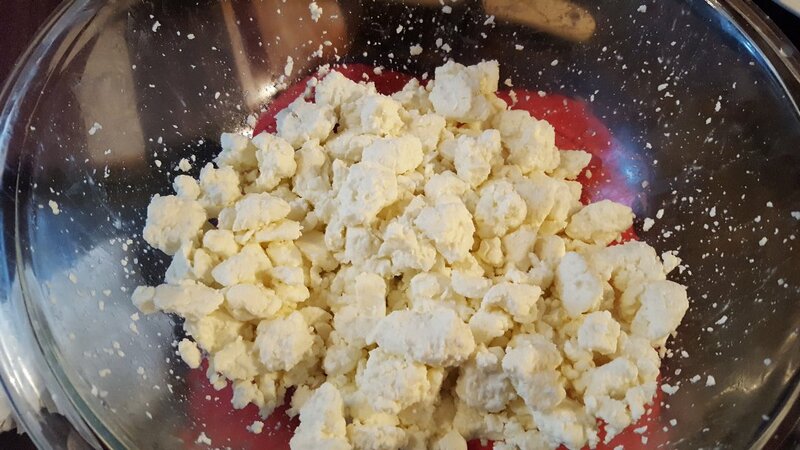 I do not have the patience to make homemade cheese, but it's really interesting to hear and see what you are doing. When we were in Italy for the first time last summer we had the buffalo style Mozzarella for the first time ~ I didn't even know that it existed until then. I was confused by the term buffalo, thinking I was losing something in translation, because I was thinking of the American bison. Turns out the Italian buffalo is a water buffalo ~ Duh! Thanks Martha :)) It took me years to relax after I had that burnout and even five years ago I couldn't have handled this. But really, I'm just so determined to try to do everything from scratch, it's my mission in life now lol...The "Mozzarella" at the grocery store just has no flavour anymore and it keeps getting more and more expensive. I'm hoping I can succeed at the stretchy Mozza...we'll see! 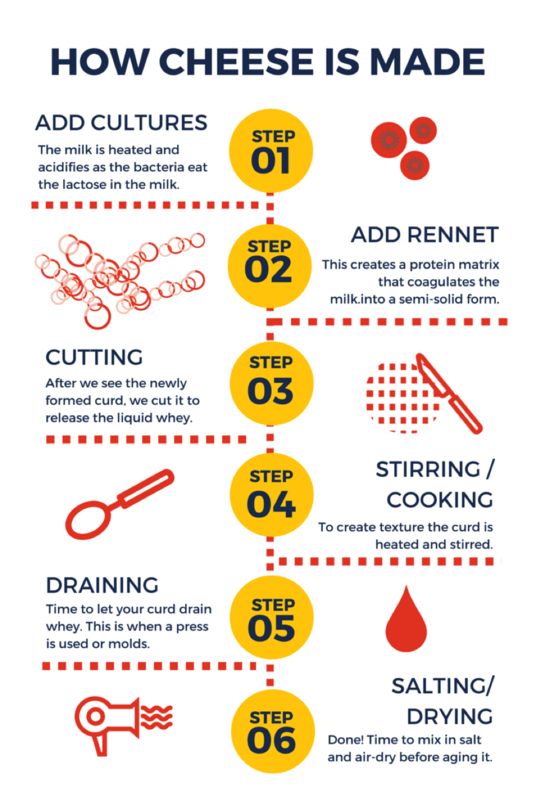 And yes, it's practice, but there are so many variables too, like temperature and also the type of milk used. I'll find the whey hee hee! Do u jave any idead why they turned out the way they did ?? Honestly sis...I have no clue. The one I make in the microwave ALWAYS turns out fine. It stretches and melts nicely, not perfectly because it's really supposed to be eaten fresh, but it WORKS. The method I used for the cultured Mozza is a little like making the Cheddar...lots of steps, temperatures, checking...I thought I did it all right. 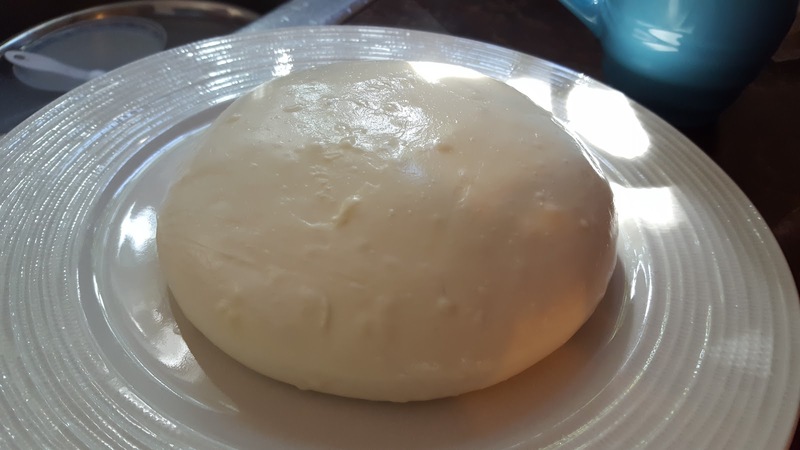 But looking at forums, and talking with the lady who wrote that cheese book...Mozzarella is a difficult cheese to make (non-microwave that is). There are so many tips and suggestions and different cultures...if I can't figure it out tomorrow, I may give it a rest for a while. One thing that was suggested was to get a PH Meter. ($$! )...Apparently at the final stage before stretching, your cheese should have a PH of 5.2-ish, and then it will be successful. But there are ways to check too, like taking a little curd and putting it in hot water for a few minutes to see if it's ready to stretch yet...lots of variable with this one. And then to confuse me more...the New England Cheese Making Company's "cheese tech" told me to check acidity and moisture retention...omg HOW??? I'm not that much of an expert yet!! !